The long, cold, hard winter in Vermont helped to generate an increased appetite for warm weather desert climbing. We recently returned from 8 fab days in Red Rock, Nevada. Climbing friends, stories and photos never tell the whole story, but can provide for some flavor. What feels more meaningful in the reflections is the gain of new perspectives. I find that going on climbing trips, even short ones, can open my mind and shed light on things I might otherwise take for granted or ignore. A prime example is gratitude. How fortunate were we to be able to take a trip such as this, have great weather, a comfortable place to stay, wonderful friends to share adventures and meals with, and air and car travel without incident? No injuries, no illness, no delays, no conflicts. In light of the horrors of today - a devastating earthquake in Nepal; violent protests in Baltimore and other cities; suicide bombs wreaking havoc on innocent civilians. Wow, I feel so fortunate. On the darker side of perspectives, I continue to be appalled by the behavior of people in the outdoors, seemingly oblivious to their impact. Of course we all impact the land and resources in some way when we trudge along the paths in search of our custom adventure. But the increase in popularity of climbing brings with it numerous problems - most notably impact on the land and land-based features; impact on other people sharing that space; light and noise pollution. Worst of all is an example of human behavior at its lowest - or at least at its most ignorant. On one popular climb we hiked up the steep trail to the base of a wall only to find a pile of human feces right on the flat rocks at the base of the route. A small piece of toilet paper shoved underneath an adjacent rock indicated a complete disregard for impact - or as mentioned, incomprehensible ignorance. I am relieved that The Access Fund has stepped up their efforts to educate climbers and direct efforts into preserving our climbing future. And of course all such efforts do not just preserve my beloved recreational activity, but all organizations with conservation and protection missions are essential to continuing on this planet in the SHORT term. I keep striving to do my part. I am trying to change my own behaviors, lead by example, think twice before I do something that may have impact on others - instead of lecturing from a pedestal. I am so far from getting it right when it comes to following responsible and ethical practices - but I will not stop trying to get it right. All I can hope for is that everyone else will work on it, too. I know there are a few readers out there who just want to read the stories and gawk at climbing photos - OK - I like posting that stuff anyway, so no worries. But I ask that you keep in perspective the past and the future. Honor history - respect the earth - recognize others - widen your perspective beyond yourself and your mini-world. We can all do better. Nancy on her first real outdoor climb! Go girl! Group Therapy Pitch 2 - Annie heading up. This route is 600 feet of committed climbing. The intimidating 5th pitch Group Therapy. Runout, scary chimney climbing. Me no like. Toby, friend from NH, (who has been living Vegas for the winter to climb) coming up pitch 2 of Birdland, classic! As I waited at the 4th belay, my 3 comrades waited at the 3rd belay. A cute photo, but 2 climbers who were rapping down the route stopped all other upward climber progress while they untangled their mess and tried to figure out where to go next. I can't help but wonder if they knew that 90 minutes is really an unacceptable amount of time to make climbers wait. Super fun and easy finger crack finish on Birdland. Thanks for giving me the sharp end Toby! Heading out of the tunnel on Tunnel Vision (a weird tunnel behind a huge flake high on the route). I hated the 1st 3 pitches of this, but if you like chimneys and squeezes like Toby does, you'll be in heaven. The last 3 pitches were great. Another fine crack finish on Fold Out. More technical than it looks! Jorge Urioste - the king of Red Rock climbing in the 70s and 80s and beyond. 78 years old and still climbing strong! Yesterday another piece of climbing history was marked. Like a waypoint on an endless journey, Tommy Caldwell and Kevin Jorgeson made their mark after free climbing all pitches on the Dawn Wall, El Capitan, Yosemite. While photos of the great walls of Yosemite are awe inspiring, being there injects astonishment into the bloodstream. And climbing on the glacial granite there is like no other experience, yet for climbers it's almost just another great day outside on rock. Tommy and Kevin's accomplishment is of such a grand nature and climbers all around the globe were following their progress. How exciting it has been to see the national media cover their story among the daunting and disheartening stories of gun violence, ISIS and terrorism, politics and human suffering. While we should never lose focus of the atrocities in the world that need our thought and thoughtful action, we also welcome that injection of wonderment and optimism. Tommy credits his optimism for much of his climbing success. And as I read a book on Learned Optimism (by Dr. Martin Seligman), I am reminded that Tommy is a model of this psychology and am motivated to learn and practice more! As a climber though, I also cannot help but analyze the feat accomplished on the Dawn Wall. 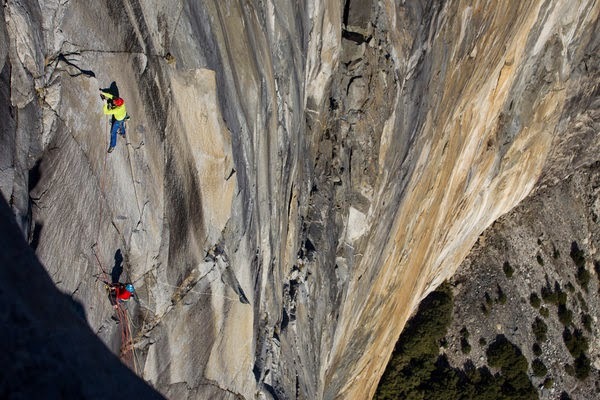 Their ascent is considered perhaps the hardest free climb in the world. With the explosion of climbing popularity that is creating so many talented climbers today, no doubt this waypoint will be remembered as just that - another mark on the timeline that provided opportunity to the next optimistic elite climber to achieve the next level of triumph. For now at least, many of us still seem to remember the great pioneers of rock that have cleared the path for the great pioneers of today. But I am honestly concerned that as time marches on these pioneering achievements will fade and become lost. Time has a way of eroding all things. For now, may we all remember and respect those who have gone before us and created opportunities we would otherwise not had. And if you want to analyze the specifics and style of this recent achievement, check out this documentation of great big wall hard free climbs over the years. It helps to put in perspective what great climbers have done and how they did it. Tommy and Kevin did this climb all in one push - meaning they never retreated to the ground between attempts on the harder pitches. They went up with every intent of not coming down until they finished the project free and clean (no falls). But they did have support. Food and supplies were brought to them. Cameras and climbers on adjacent routes were all around them capturing their struggles and successes. What is next for these climbers and others like them? We can never capture the same moment twice - which is one of the unique and attractive things about climbing. The route, the conditions, the company, the energy all change each time we climb - this can make the same route feel different each time we climb it. And no doubt a new style of climbing is evolving and will continue to be molded by new talents, approaches and perspectives. As long as we do not lose site of the past that brought us here, we can appreciate the value. I have never thought of climbing as a competition (which is only one reason I feel indoor wall climbing is so completely different from real rock climbing). Great achievements like The Dawn Wall Project is on one incredible level - beating someone to "the top" is quite another. And if you observe video or photographic footage of Tommy and Kevin during their quest, it will become obvious that their attitude is far from competitive. Soak up some of the comments they make when asked what they were doing and why. Tommy precisely describes how rock climbing really is unlike more familiar and culturally popularized sports. He says "It's about spending our lives in these beautiful places and forming these incredible bonds." Of finishing the climb with or without Kevin, Tommy said "More than anything I want to top out together....It would be such a bummer to finish this thing without Kevin. I can't imagine anything worse really." Kevin echos a non-competitive sentiment. "This is not an effort to conquer. It's about realizing a dream." Thanks guys, for representing our beloved sport in such a mature and gracious light. Tomorrow is Election Day. It is important to vote. The act of abstaining gives away your power as a citizen. Even if you are fed up with the political rhetoric, corruption and game-playing, your vote DOES matter. Consider if you do not vote that you are letting others, who do, decide for you. If you want to complain, use your vote. Take responsibility, make a difference, exercise your rights! Climbers, make a difference by joining in the Access Fund's new initiative The Rock Project. Commit to The Pact to be a responsible climber who lives by the guidelines of the pact and helps others to do the same. Watch the video for an easy explanation of this initiative and do your part. Spread the word any and every way you can. This is just the start - but our climbing future depends on it! We returned a week ago from a 9 day trip to Denver, CO for a family wedding. The first half of our trip was mostly consumed with family events. But I did get to sneak out one day with Randy to climb. That day it was cold and rainy (even a few snowflakes) in the immediate Denver area. But the forecast looked good se we headed south to Colorado Springs for the day. It was there that we both embraced the unique climbing experience at The Garden of the Gods. This city park boasts beautiful sandstone sculptured rock formations. Rock climbers need only fill out a form for a free climbing permit and be on their way. What I found most unusual was that other visitors and tourists are walking throughout the park directly beneath these formations some of which have climbers ascending them. I couldn't help but think how dangerous that is for the folks on the ground - one dropped carabiner, belay device or a piece of broken rock could spell curtains! Needless to say I was especially careful handling our gear. Our first route was The North Ridge of Montezuma's Tower - this thin rib or sliver of sandstone rises about 120 feet from the sand floor. The route climbs along the rib or ridge - providing incredible exposure as you tip-toe along the balance beam with minimal protection opportunities. The photo of Randy coming up does not accurately depict the feel for this climb. After the wedding events came to a close, we headed to Shelf Road, a popular sport climbing venue near Canon City, CO. Here the rock is limestone, a sometimes sharp and crumbly rock to climb on. We enjoyed camping and climbing with Randy and Dan for 2 days there with unseasonably hot temperatures our second day. I found most of the grades here a bit soft for what we are used to in places like Rumney. What struck me most about the routes at Shelf was how many cracks had a line of bolts next to them. Many of these routes were likely climbed on removable traditional gear in the past and could be today. Yet the sport climbing mentality has trumped tradition here in my estimation. Our last rock venue in Colorado was Clear Creek Canyon near Golden. It was simply too hot to climb in Eldorado Canyon, so our tour guide Randy knew the cool spots to go not far from home base. Annie was our "rope gun" the first day, putting up 4 routes in a row at the East Colfax wall. 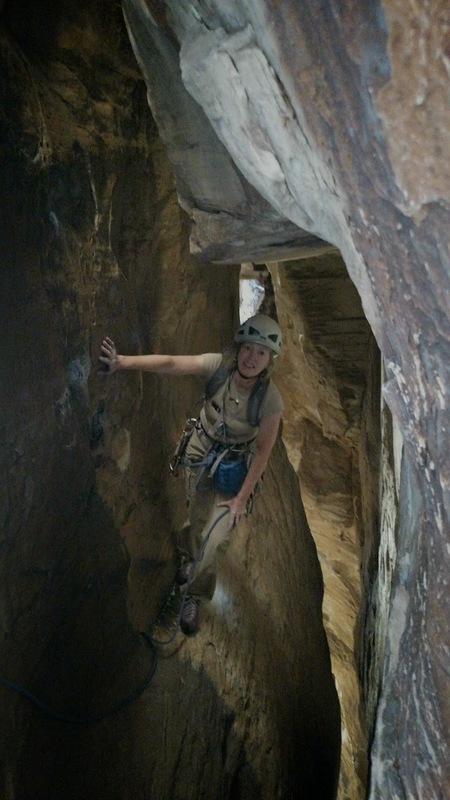 The next day we climbed at The Canal Zone at the bottom of the canyon. Great sport climbing with well protected routes. Again, a little soft for the grade with a couple of exceptions. We returned to mighty fine fall weather in Vermont. While foliage is not at peak yet near home, it certainly is up north. On Saturday we went back up to Groton, VT the home of Marshfield Ledge. The 3 pitch route we climbed rewarded us with a view as magnificent as I have ever seen. Words cannot describe it. See for yourself. Pitch 2 of "Just For Goobs", Marshfield - just look down! I received our new Adirondack Rock guidebooks today. Seems like not long ago the fab new guidebook came out on Adirondack rock climbing, but Jeremy and Jim have done it again. The Two Volume set is so impressive I couldn't help but to snap a photo of it. The covers and bindings are super sturdy and the artwork on the cover and throughout the books (illustrator Colin O'Connor) is delightful. They come with a slip cover to hold both books securely. Color photos, color topos, history, new routes and so much more. It might take me all winter to peruse this one! Nice job guys! The Second Edition of Adirondack Rock. WOW.